Dom Dwyer tied it in the 71st minute, getting behind the central defense on Oriol Rosell’s through ball and chipping it over the goalkeeper to tie it at 2 for Orlando (7-15-2). 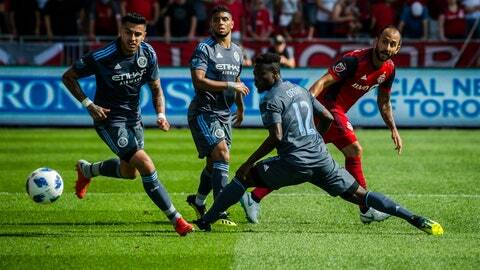 TORONTO (AP) — Ismael Tajouri-Shradi scored his second goal of the game in the 88th minute to lift New York City FC past Toronto FC. The New York City attacker drove a left-footed volley past diving goalkeeper Alex Bono’s for his 10th goal of the season. David Villa also scored for New York City (14-5-5). Sebastian Giovinco and Victor Vazquez scored for Toronto (6-12-5). The defending MLS Cup champions lost Jozy Altidore to a red card 11 minutes into the match. He was sent off for kicking New York defender Alexander Callens, leaving the striker facing at least a one-match ban for next weekend’s trip to San Jose. The loss ended Toronto’s all-competitions unbeaten streak at six. SEATTLE (AP) — Nicolas Lodeiro’s free-kick goal in the 63rd minute was the winner as the Seattle Sounders defeated FC Dallas for their franchise-tying fifth straight victory. Seattle (9-9-5) is unbeaten in eight matches to improve to seventh place in the Western Conference. Despite the loss, Dallas (12-5-6) still leads the conference standings. The Sounders set a club record by earning 11 corner kicks in the opening half, the 10th of which was headed into the net by Chad Marshall off a cross from Lodeiro. Dallas tied it seven minutes into the second half when Dominique Badji, who made his FCD debut, finished off a nice combination of passes with his chest from close range.